In the 1950s, the perfume industry boomed in Belgrade. 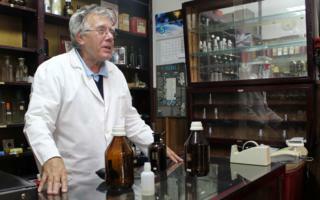 Now Serbia's capital has just one shop left that mixes its own scents. Andrew Gray went to visit. I hesitate before the deep maroon shop front. The shop, in a cobbled street in central Belgrade, looks like it hasn't changed in decades. Little bottles of scent and old black and white photos decorate the window. A sign in gold lettering says "Parfimerija Sava". I don't think I have ever been inside a perfume shop in my life. But today curiosity pushes me over the threshold. The interior is tiny. Large jars of clear and brown glass fill the shelves. Behind the counter stands a tanned man with a shock of grey hair, wearing a white coat. His name is Nenad. I tell him I'd like to know more about the shop. Soon, story after story comes tumbling out. A few months ago, Nenad tells me, the shop was part of a special event when Belgrade's museums stay open late into the night. This makes perfect sense. For Parfimerija Sava is not just a shop but a living museum - and its own small story reflects the recent history of Belgrade and of Serbia. World War Two came to Belgrade in 1941, when it was capital of Yugoslavia, just a few months after Nenad's father opened his first perfume shop. Nenad disappears into the back of the shop and returns with quite a souvenir - an old French typewriter, sold to his father by a German soldier who came to buy eau de Cologne. After the war, communists took power and banned private business so the shop had to close. But Yugoslavia later broke with the Soviet Union and pursued a more liberal brand of communism. This allowed Nenad's parents to restart their business in 1954 - in the shop where it remains more than 60 years later, at 75 Kralja Petra Street. In the 1990s, as Yugoslavia was torn apart by nationalist wars, Nenad lost a good job as the Belgrade representative of a Croatian company and came to work in the family shop. I lived in this street more than a decade ago, after the wars had ended. What I liked about it then was the variety. There was, and still is, a shop selling Timberland clothes and a modern restaurant with colourful decor. But there was also an old picture framer, a clothes shop with a distinctly communist air and a store that displayed machine parts in the window - although I can't imagine that one ever got much passing trade. These days, Kralja Petra boasts high-end fashion boutiques and an uber-cool "concept store", selling designer clothes, jewellery and stationery, much of it made locally. Across the street is an ice-cream parlour with exotic flavours such as sesame and lemon with basil. But luxury is beyond the reach of ordinary Belgraders and Parfimerija Sava is still there to bring a little exoticism and sweetness into their lives. Nenad tells me there used to be 23 shops like this in the city, mixing scent on the premises. Now there is only this one. During the hour I spend there, a steady stream of customers passes through - women on their own, a couple, a mother and her son. If they're not sure what they want, Nenad dips a pump with a long needle into one of those big glass jars, squeezes the rubber handle and sprays scent on to their arms. He sells versions of famous fragrances but isn't allowed to use their names. So he pulls the black lid off a typewriter and taps a code on to a label instead. Nenad also produces his own fragrances, including several created specially for Belgrade's Night of the Museums. He sprays two for men on to my arms, one smells of citrus, the other is muskier. He asks me which one I prefer. I never wear scent but I rather like the second one. On my last evening in Belgrade, I make it back to the shop just before closing time. Nenad tells me he will keep the business going as long as he can at least break even. It's hard to do much more than that. He shows me a list in pencil of all the taxes and charges he has to pay. Nenad also has a couple of presents for me - two advertising leaflets for the shop from the 1950s... and a bottle of scent. He refuses to take any payment, calling it "a gift from the heart". Now, the internet is a wonderful medium but there are some things even it struggles to convey. However, if you lean in a little, you might just catch the faintest whiff of Belgrade Night, Number Two.